The other day someone asked me if I was on Instagram. I had to admit that I was not. I’d tried Twitter and thought about Instagram, but blogging seemed to be the platform for me. But the question suggested to me that perhaps it was about time I was on Instagram, and prompted me to have another go. I now have an Instagram account, @philipbuildings . It will not be a torrent of images, but my initial plan is to post more often than I blog, and offer a selection of things I’ve seen, mostly but not exclusively architectural. I’ll probably include more pictures of places and buildings near where I live – I have done blog posts about quite a few local buildings over the years, but as my blog is called English Buildings, I try not to have to much of a local bias. This is not meant to replace blogging for me. For now at least, I intend to carry on here in my usual way. But do have a look at my Instagram and feel free to follow, like, and share. The clock in the picture, by the way, is in Bridgwater, and is an elegant Art Deco object that reminds me how often shops were adorned with timepieces in the 1930s and the following decades. It marks a branch of the jeweller’s H. Samuel. 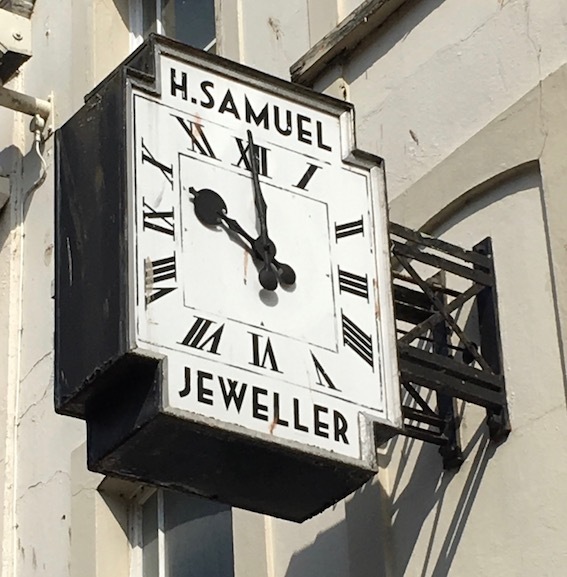 The H. Samuel chain was begun in 1862, when Harriet Samuel took over her father-in-law’s clock-making business. It’s a familiar name on British High Streets, although now owned by a larger global retail group. Many people who are familiar with H. Samuel’s stores do not realise that they are named after a woman, an unusual example of the acknowledgement of the major female role in early retailing. The fourth of my summer reviews is a work of both social and architectural history that throws revealing light on a subject of great importance. This is the last of my reviews for now – it will be back to my usual, more architectural, posts, soon. This is a history of council housing in Britain. It combines architectural, social, and political history, to tell the story of this form of housing from its roots in the late-19th century, its real beginnings in the period after 1900, and its growth and eventual decline. Along the way the book profiles planners and architects who wanted to improve people’s lives by building better housing – and creating better environments for residents, many of whom had had to endure slum accommodation. It addresses the various political views that have had an impact on the story – the groups who have embraced council housing and who have condemned it. It discusses the economic constraints on the movement, the varying social backgrounds of those who’ve lived in council housing, the transformation brought by the right to buy policy, and the issues surrounding the restoration of housing types from terraces to tower blocks. The author explodes many myths. Council housing was not at first expected to be solely a way of housing the urban poor, not a last resort for the desperate: many early estates were envisaged as mixed communities, containing middle-class and well as working-class families. It was not a form of housing promoted solely by the Labour Party: the government that built the most council houses per year was Macmillan’s Conservative administration. It was not all tower blocks: the ‘cottage estate’, with much in common with garden cities and suburbs, had a major role, especially in the interwar period. Tower blocks do not provide higher-density housing than low-rise: tall towers need space between them (to reduce the effect of shadowing and overlooking) and this evens out the density. Not all high-rise estates became ‘problem estates’. And so on. Boughton is a passionate, but measured, advocate of public housing, who has produced a highly readable narrative with great pace. His book is written from a left-wing perspective (and comes from Verso, who publish Bernie Sanders and Tariq Ali – and also, with concerns relevant to this blog, Owen Hatherley and John Berger) but this shouldn’t suggest that it is unbalanced or unaware of the problems surrounding social housing. Municipal Dreams is an inclusive account, covering a neglected aspect of British history that has had a huge impact on both our built environment and our wider society. I’ve learned a lot from it, as I have in the past from Colin Ward’s work on housing (written from a very different political perspective) and the pioneering text book A Social History of Housing by John Burnett. Apart from such histories, it’s not a well ploughed field, and Boughton has cultivated it richly. The third of my summer book reviews is a general book on world architecture with a fresh and visual approach. When I was a teenager and starting to become interested in architecture, I looked everywhere – bookshops, the local library, other people’s houses – for information about the subject. After a while it became clear that certain buildings – star examples – recurred in many books, and some of these buildings baffled me. Two of the most baffling were Le Corbusier’s pilgrimage chapel of Note Dame du Haut, Ronchamp; another was Erich Mendelsohn’s Einstein Tower, Potsdam. Both of these unusual, curvaceous structures seemed to be puzzles. What, I asked myself, was going on in the Ronchamp chapel’s extraordinary billowing roof? Whatever, apart from the telescope at the top, was inside the Einstein Tower – what did it do? There were plenty of books that told me about how the structure of a Gothic cathedral worked, but few that explained how the shell-like roofs of Sydney Opera House stood up or even that showed me the spatial organisation (if organisation is the word) of Sir John Soane’s Museum in London. I wanted not just to look inside these buildings, to open their doors, but to get deeper under their skins. It’s a bit easier to find this kind of thing out today, but the range of architecture and its bewildering forms (think the Guggenheim Bilbao, all wriggling shimmering curves, or Calatrava’s various essays in white-painted steel) means that there’s still a role for a book that gets under the surface of some of the world’s great buildings. 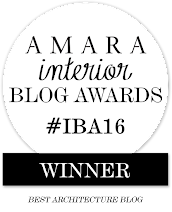 That’s where Architecture Inside + Out comes in. It shows us 50 buildings (a representative selection, featuring a wide range of places and styles, but with a heavy stress on the 20th century architecture), each in a selection of colour photographs and in Robbie Polley’s cutaway drawings that reveal interiors, spatial layouts, and structures. To take one example, at Bilbao, the short explanatory text is accompanied by a colour photograph of the Guggenheim’s exterior plus a couple of interior shots that give a sense of the character of the museum’s diverse internal spaces. To these are added a drawing of the exterior (giving a sense of the titanium skin and the rectilinear organisation of the building, something difficult to grasp in most photographs), a cutaway drawing showing the way the skin and inner framework connect, a cross-section, and a plan. Each of the 50 buildings has a series of variations on this mix, which takes in – inter alia – public buildings from the Colosseum to the London Aquatics Centre, buildings for the arts an education from the Soane museum to the National Museum for African American History and Culture in Washington D.C., places to worship from Hagia Sophia to the Sagrada Familia, and, yes, Ronchamp. The approach of photographs plus drawings works less well in some cases – there’s a limit, for example, to how much a cutaway of a an honest, almost transparent building like the Charles and Ray Eames House in Pacific Palisades can tell us – but overall the approach works and gets us closer to what makes these diverse buildings tick. 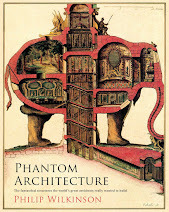 Anyone looking for fifty ways into architecture should consider this book. The second of my quartet of summer book reviews is a massive work of reference on an architectural style that, having fallen out of favour, now seems to be fashionable again. I’ve been impressed by a number of the recent books that have helped us to look with a more informed eye on the concrete buildings of the 1960s and 1970s and have led to a new appreciation of the architectural style known as Brutalism. One of these books has already been reviewed here; others have got me thinking too. I lived through the period when these buildings went up and was educated in a school designed by one of the most celebrated (and occasionally reviled) architectural practices of the period, but these books have told me more about the period and the interest of its architecture. But I’ve been left uncertain of the wider context, and of the definition. What exactly is Brutalism? Every book seems to have a different perspective on this, and much of what I’ve read covers Britain, but doesn’t set this country in the wider picture of world architecture. How unlike books about 1930s modernism, which can’t wait to tell us about Le Corbusier, Watler Gropius, and Ludwig Mies van der Rohe, and rightly so. SOS Brutalism helps with this context. It’s a global survey in two large volumes of Brutalist architecture, combining the views of one hundred authors, several of whom have written extended essays and case studies published here. The first of the two volumes, the big fat one, begins with a short series of essays and case studies. British readers will be especially interested in two contributions by leading authorities: ‘British Brutalisms: New and newer’ by Barnabas Calder and ‘British Universities: Opportunities for a rising generation’ by Elain Harwood. But there are also pieces looking at varieties of Brutalism, and at the style in places from Japan to the former Yugoslavia. The rest of the fat volume consists of a generous coverage of 120 buildings from all over the world. This gives a broad picture of Brutalism across the world, with enough illustration in the form exterior and interior photographs, details, and, sometimes, plans or cross-sections, to give a sense of each example. This reader was pleased to be introduced to a variety of interesting buildings in South Asia and Latin America, and to be reminded of the Brutalist architecture of Eastern Europe (and by a writer ready to admit the elasticity of the term ‘Eastern Europe’* and keen to stress that generally architects in this region did not use the term ‘Brutalism’ at all). Concrete addicts will not be able to get enough of all this, and some of us will marvel at the depth of interest in parts of the world we’ve not visited, from Africa to South Asia. 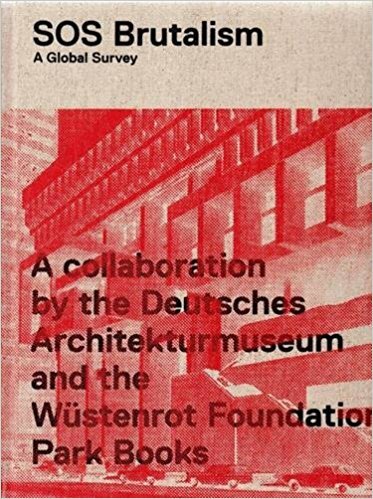 This volume is bundled with a second, slimmer but still substantial, of contributions to a symposium held in Berlin in 2012, and published under the auspices of the Wüstenrot Foundation. 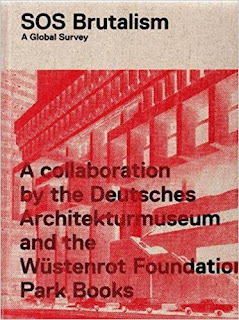 This material consists of a further 17 essays, some on specific buildings such as Hunstanton School and the Czech embassy in East Berlin, some on particular countries (Italy, the USA, Japan, Germany), still others on more general themes, wrapping up with studies of New Brutalism’s relevance today and on the issue of giving these buildings the status of historical monuments. This whole project, which includes a huge amount of previously unpublished material, is impressive, monumental, and far too large to be done justice in a short review like this. This review is simply a pointer. If you’re at all interested in the subject, find a copy of this impressive double volume, look at it, and decide: it will almost certainly be for you. *Many Czechs. for example, insist that their country is in Central Europe, and they have a point. Vienna is more easterly than Prague. 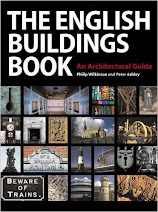 For the next week or so, English Buildings becomes a book blog, and I'll post a handful of recent books that have caught my eye. First, an important addition to the architectural library from Historic England. This book is a major contribution to architectural history and to wider cultural understanding. It is the first full-length study of mosque architecture in Britain, and starts with the very beginnings: the first mosques in Britain, such as the outstanding Shah Jahan Mosque in Woking (1889), designed by William Isaac Chambers and complete with onion domes and ogee arches: an early example of a style that would become associated with Islam in England. However, as the book shows, mosques can be much plainer buildings, often adaptations of existing houses or chapels. As the book makes clear at the outset, the main basic architectural requirements for a mosque are few: a prayer hall in which worshippers can stand facing the Ka’ba in Mecca; a place for ritual ablutions. The story of the adapted structures is told alongside the many purpose-built mosques that were put up in the wake of increased migration to this country after World War II. By the 1970s and 1980s a repertoire of architectural symbols – domes, minarets, certain types of arches, decoration using geometrical abstract patterns, and so on – had become established as a way of expressing Muslim identities through building. This identity was expressed in major buildings such as the London Central Mosque (Regent’s Park Mosque) and the East London Mosque, both landmarks in the capital. A revelation, though, is the architectural quality of a range of major mosques, from Gloucester to Bradford. This is already a rich artistic tradition. The book’s many case studies discuss and illustrate these major structures in some depth. They do so against a background of the social history of Islam in Britain, and with a clear eye on the various ways in which these buildings are used. The British Mosque is a fascinating book, and fills a major gap in the architectural history of these islands. I wonder if Hook Norton, a large village in North Oxfordshire, can stand as a symbol of what I respond to in England’s rural settlements. So far, I’ve posted about this village’s remarkable brewery, about a Shell petrol pump globe, and about Hook Norton’s early, and lovely, Baptist chapel. Buildings and objects like these are very much the kind of things that appeal to me, and that have, I hope, animated the posts on this English Buildings blog for nearly 11 years. All I need is a parish church and a beautiful, hand-painted sign and I’ve got the essence of my interests. And Hook Norton is rich enough to oblige. The parish church, then. 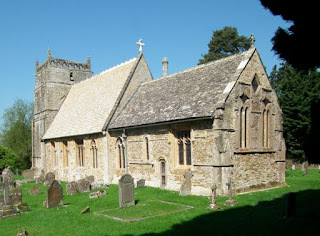 I’ve visited St Peter’s Hook Norton (beautiful, large, airy, part-Norman, partly from the later Middle Ages) several times over the years, but only on the most recent occasion with the Resident Wise Woman. ‘You must come in here,’ I said to her. ‘There’s something you’ll really like.’ I knew that the primitive, but charmingly folkish carving on the Norman font would be up her street, and I hope it appeals to you to. On the face of it, the relief decoration on the font is very simple: Adam, Eve, a centaur-archer, a figure carrying a water-bags, a lion-like creature, and a monster out of the bestiaries with two heads, one in his tail. But before we dismiss the simplistic carving, there’s much to keep us looking. ‘EVA’ and ‘ADAM’ are named, as is the archer, ‘SAGITARIUS’ and the latter identification encourages one to speculate that the lion could be Leo and the water-carrier Aquarius, though the two-headed monster (sometimes referred as an amphisbaena, although, strictly, an amphisbaena was a two-headed serpent) is in no zodiac that I know. The inscriptions also make one wonder if more people in the Middle Ages than we think could read – someone at any rate could spell out these words and tell others that here were the first man and woman. 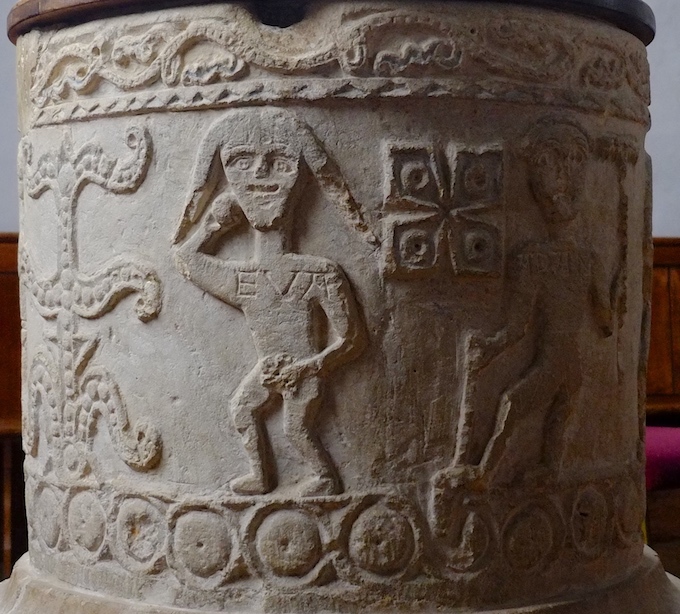 Adam has already begun to delve – he carries a rake in one hand and a spade in the other, and has dug into the band of ornament running around the base of the font. Eve has not, though, learned to spin, and seems more concerned with addressing her modesty. * The faces, apart from Eve’s rather pointed foxy visage, are charming, and some of the eyes have that tendency to look out at you directly from faces in profile that we see in many periods and genres of art, from ancient Egypt to the Cubists. I am charmed especially by the amphisbaena, in intimate conversation with himself, as many of us are. There is a much better photograph of it than mine, by John Piper, in the Tate collection, which is worth a look. He had a good eye for these eyes, did Mr Piper, as he did for the more general charms and visual interest of the English village.† I’m pleased to follow in his footsteps, even if my own photographic efforts are, compared with his, as crude as the work of the Hook Norton carver. * At least I think that’s what she’s doing. † People who visited the recent Tate Piper exhibition, which has also been at Warwick Arts Centre, might be forgiven for thinking, from a misleading caption there, that Piper took all his pictures with a box Brownie camera. John Piper wrote in a note on equipment prefaced to a book of his photographs that he started with a number 2 Brownie, but bought a secondhand ‘Ideal’ camera with a Zeiss lens in Broughton when he was about 18; this he used until he was 60, when he treated himself to a Hasselblad. See John Piper, A Painter’s Camera: Buildings and Landscapes in Britain 1935–1985 (The Tate Gallery, 1987). Over the years I’ve blogged several times about museums, large and small. Although I’ve sometimes thought about this blog as a kind of virtual or imaginary museum in its own right, I’m convinced that what are sometimes called ‘online resources’, good as they are, will never replace the real thing. Marvellous as it is to have, for example, images of and documentation on great swathes of the V&A collection online, there’s nothing like going to South Kensington and looking for oneself. On a few, hugely educative, occasions, I’ve had the good fortune not just to visit a museum as a member of the public, but also to get access behind the scenes and to meet curators, who’ve told me much about the objects in their care and their work with them. I remember fondly, meeting one person who not only cared for objects in the British Museum but who regularly travelled to places such as Jordan to work as an archaeologist; an afternoon at the Wallace Collection with the man who cared for their collection of arms and armour, who gave me not just a scholar’s but a also craftsman’s insight into how an elaborate Renaissance suit of armour was made; and a day with an anthropologist in Oxford, who told me about certain African tribes for whom the resource of fire was so precious that they’d carry it around inside enormous leaves. I have many reasons to be grateful to Britain’s museums, and was very pleased to be asked to be guest speaker at the AGM of the Friends of the Wilson, the group that gives invaluable support to Cheltenham’s museum, The Wilson. 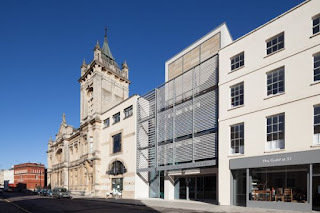 I didn’t have time in my short talk to mention the meetings I’ve just remembered, but I did say how important this particular museum was to me, especially when I was a child, growing up in Cheltenham – this museum, which didn’t then have its current name, was the first one I ever visited. I’ve dwelt in previous posts on objects held by the Wilson that mean something to me personally. And Cheltenham has much to be grateful to the Wilson for – for a start: a stellar collection of Arts and Crafts Movement objects, archives of the eponymous Wilson family, including its most famous son the antarctic explorer Edward Wilson, and vast amounts of material on one of England’s most interesting towns. When I first went to Cheltenham’s museum in the 1960s, it seemed like an ancient place, full of dingy corners and objects that cried out for more explanation (from an eight-year-old’s perspective they did, anyway). Today, the place is transformed, with not one but two extensions and better displays, information, lighting, a new gallery created specially for young people, and more. This process of change is symbolised from the outside by the series of architectural phases visible from the street. The first phase, which accommodates the public library, is visible in the distance. It’s a quite punchy Jacobethan design of 1887–9 by local firm Knight & Chatters. In the middle is the first part of the museum, which replaces an earlier art gallery that had been built a decade after the library. This 1987–9 rebuild is by Borough Architect David Ross, but with Sir Hugh Casson as consultant. It’s a facade of stucco and stone banding, paying tribute in these materials to Cheltenham’s older buildings while embracing a new, but not assertively new, architectural style. Pevsner sees a touch of Art Deco influence in it, which is true. But I also see, in that great sweeping curve over the entrance, a nod in the direction of the great Art Nouveau architect, Charles Harrison Townsend, who loved such shapes and such embracing entrances, especially for public buildings such as galleries and museums. Then comes the most recent extension, by Berman Guedes Stretton, completed in 2012. This added 1250 square metres of gallery and ancillary space, as well as allowing for better circulation. Not all my readers will appreciate its exterior grid facade, but the addition has done the museum good service in giving it the improved facilities it needed. For what it’s worth, I think the facade works well. It manages to sit near Victorian and Regency buildings without dominating them, it manages to both respect the building line and step back from it, it makes you wonder what’s inside, through that broad entrance, and the screen at the front makes one question whether there’s a building there at all. There is a building there, of course, and it’s full of wonderful things. While spending half an hour giving a talk about what I do, I was very pleased also to give tribute to this excellent museum, which even in times when ‘austerity’ is a watchword and ‘funding’ has become a cry for help, is thanks to its collections, its buildings, its curators, and its Friends, very much alive and kicking. The photograph above is taken from the website of the Civic Trust, because this is a better image than I have in my own files. I cannot see a copyright line on it, but if my using it infringes anyone's copyright, I'll be pleased either to add a credit or remove the image. Although they don’t always make a big thing of it, allusions to military architecture fit rather well with the martial metaphor used by the Salvation Army – ministers and lay leaders given quasi military ‘ranks’, places of worship called citadels, the use of brass bands. * There are quite a few Salvation Army citadels with facades that draw on the vocabulary of fortification: turrets, crenellations, arrow slits. This one in Sheffield, designed by William Gilbee Scott, is a good example. It has been empty for nearly 20 years since the Army left,† but plans are afoot to renovate and repurpose the building with minimal changes to the front, at least. What we have for now is a fine if dilapidated facade, which is castle-like at the very top, with its trinity of towers, the central one larger and turreted, to resemble a gatehouse. Behind it’s mostly a brick shed, fitted out within with raked seating and a balcony, rather like a theatre. There are big windows, at which point the similarity to a castle fades away, yielding to the necessity for a light interior in which one can read the words in one’s songbook. The building presents an assertive face to the world then, but this is hardly inappropriate for the Army, who combine their hands-on, hard-working approach to solving social ills with an ethos of vigorous preaching. It’s also right for a big city like Sheffield, which is hardly a place for architectural shrinking violets.§ There are a lot of assertive facades in this city, all yelling for attention. Why should the devil have all the best fronts? * And it should be emphasised that it is a metaphor. The Salvation Army fights by getting out there and helping people who need help. † For a location in Psalter Street: you couldn’t make it up. § Although it can sometimes be a place for thriving architectural buddleia, alas. I do hope the botanic invasion of this facade is put right soon. This is the last of Sheffield from me, for a while. 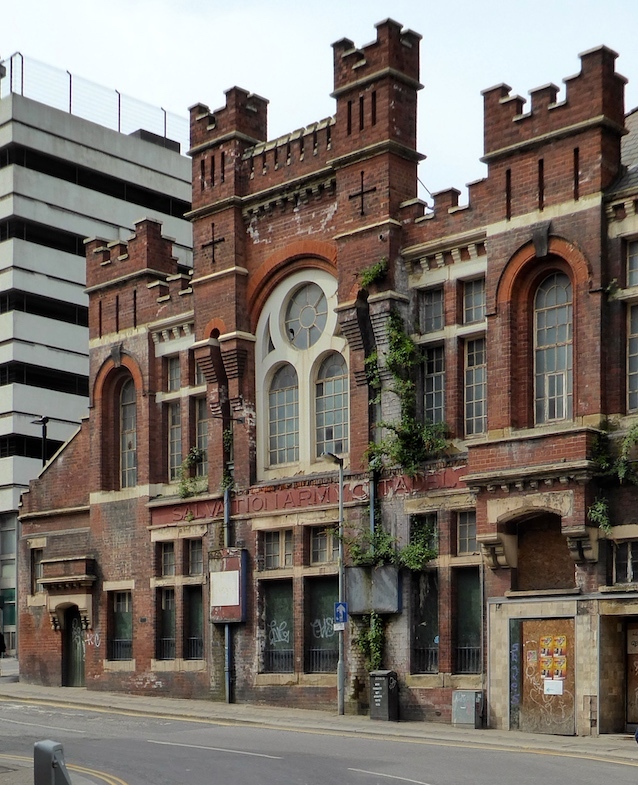 On to other matters soon – although I do hope to cover the city’s great neighbour Leeds in the not too distant future. The structure of the original shop front is still there, but with new signage and some damage to the tiling. But the interior is where it gets really good. One side has a counter with a tiled front bearing legends such as ‘Lipton’s Pickles’ and ‘Cooked Meats’, all in beautiful curly green lettering of probably c. 1910. The walls behind the counter are tiled in green and white too. This was the side of the shop where the fresh produce was sold – eggs, butter, cheese, bacon, and so on. On the other side is a panelled wooden counter with a range of shelves behind, for the tea, coffee, and stuff in bottles and jars. These shelves, still used for jams, preserves, lemon curds and other delights by the baker’s who occupy the shop today, are beautifully made in dark wood and topped with a tiled panel with a slogan that shoots from the hip: ‘The business of which the sun never sets.’ Yes, Lipton’s was the biggest chain grocer in the UK† and had imperial ambitions, for the British empire was, back then, the one ‘on which the sun never sets’. Yes, Lipton’s were big, once. They were still a large concern in the mid-20th century and I remember their branches from when I was young. But they never had the really large shops of their old rivals Sainsbury’s or brash new, pile-it-high-sell-it-cheap Tesco’s. They were eventually bought up and shops either rebranded or sold off. The name had gone by the 1980s. The people who work in the baker’s in the former Lipton’s in Chesterfield and proud of their shop: they keep it spotless, welcomed me when I asked if I could take photographs, and run what looks like a successful business – the place was full when I was there and I was diving and dodging to avoid getting in people’s way. It was in every way a pleasing sight. * For more about Lipton’s, see Kathryn Morrison’s site, here. † Lipton’s, Sainsbury’s, International Stores, Home & Colonial: these were the big British chain grocers of the 19th and early-20th centuries, before the supermarket era. In truth, when I passed through the other day the weather was so gloomy I couldn’t possibly comment. It wasn’t the day for stopping and looking around, so I pressed on. But I did see one sight that made me resolve to return: the 1930s Clock Garage, which sits at a roundabout on the A511 at Woodville. What I could see through the gloom impressed me.† As the weather was too poor to take a decent photograph, I share one from the public domain, to give you an idea of the Art Deco glory of this building. The white walls, flat roof line, curving corner towers, glass bricks, and sans serif lettering are just the thing one thinks of when someone utters the phrase ‘Art Deco garage’. 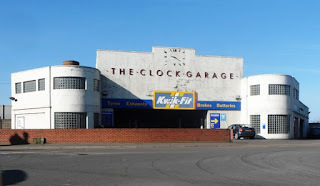 This is a structure almost up there with long-lamented 1930s landmarks such as Golly’s Garage, a lovely design with flat roof and strip windows once in London’s Cromwell Road, and Collier Filling Station, Sheldon, Birmingham (1936, by Harry Wheedon, circular, with a tall mast).§ The Clock Garage is just as much of its time as these, and one half expects to see someone standing outside dusting an Alvis Speed 20...or at least a Jowett 8. Clearly, the building’s paintwork and rendering could do with some attention, but it’s good that this place is still there and still serving a useful purpose not to dissimilar from what it was built for, when the motor car was for most a luxury and the idea of travelling on the open road, even in the industrial area that so amused Mr Cutforth, still held a measure of glamour. * Cutforth’s book was published in 1962, but is a volume of reminiscences. Cutforth (b. 1909) was born in Woodville, so the description must refer to a time a few decades before the 1960s. † What I didn’t see was that there seems to be a bottle kiln behind this building. Its top is just visible behind the left-hand part of the garage in the photograph. § For more about such joys, it is work seeking out Julian Holder and Steven Parissien (eds.) The Architecture of British Transport in the Twentieth Century (Yale, 2004) and Alastair Forsyth, Buildings for the Age (HMSO, 1982). Photograph by Anthony Parkes, shared under this Creative Commons licence. It’s easy to walk past an unassuming building like this without giving it any more thought than ‘Another well kept Cotswold cottage in a village of well kept Cotswold cottages.’ And yet there is so much to look at here beyond the neat masonry (Cotswold rubble, nicely looked after), the ‘stone slate’ roof (the ‘slates’ laid in the traditional way with large ones at the eaves, smaller ones higher up), and very Cotswold chimney. First of all – it’s a museum. The nicely carved sign above the door says ‘Swinford Museum’, and the building houses a collection of traditional domestic, agricultural, and craft tools, so it’s very much a local museum. It was started in the 1930s by George Swinford, who was helped in the enterprise by the politician Sir Stafford Cripps, who lived in the village and did much to preserve and beautify it. A pair of ammonites have been let into the masonry on either side of the door way as an added visual enrichment, relevant to the building’s use. Second – that side door on the left. It’s the entrance to a small lock-up, put there in the 18th century to deal with malefactors – usually petty criminals. I’ve posted several lock-ups in the past, a few of them architecturally notable. This one is about as modest as they come, but no doubt did its job. Third – there’s what for many will seem a very unusual garden wall. This is known as ‘plank fencing’, and it is made up of thin slabs of limestone (rather like large stone ‘slates’) joined together with metal fittings. * Although we’re in the Cotswold region here, this is not your typical Cotswold drystone wall. No, this is something that’s local in this particular area – the part of West Oxfordshire that is on the edge of the Cotswolds and near the valley of the upper Thames. There are similar walls, for example, in the village of Kelmscott, where William Morris made his home, which is not many miles form here. Nothing to see here? There’s more than you’d think from a passing glance. *Plank fencing made of stone, not wood; stone slates made of limestone not slate: terminology can get very confusing in these parts.